The Goodnight Book is intended for... well, pretty well anybody of whatever philosophical or cultural background. Millions would concur with the author's experience at some point in their lives. The action-packed day that makes `winding down' difficult, the fear of what `tomorrow' may bring; pressures on the marriage, in the workplace or family; decisions looming ahead, the heaviness of grief - or the sheer trauma of moving house! It's said by psychologists that the last thing we think about at night tends to stay with us, and become a part of the subconscious, thus affecting our mental and emotional make-up. So here it is one page at a time - one page of truth per evening! "My friend has prayerfully selected his favorite stories, poems, hymns, and scriptures and created a priceless little collection of encouraging insights that will shape your night-time dreams and enhance your evening reflections. It's just the sort of thing you want to read before you pillow your head. Thank you, Richard, for placing The Goodnight Book by my bedside. It will, no doubt, make my night a good one!" 123 devotional thoughts to read before sleep, so to shape our nighttime dreams and musings. 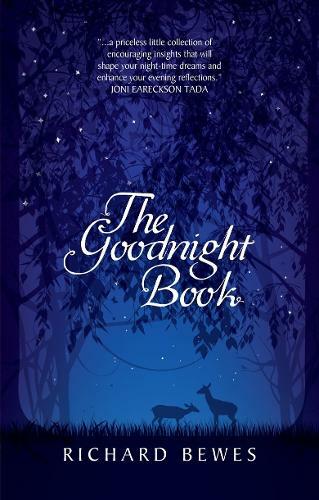 "The Goodnight Book is helpful in using phrases and words that sharpen the mind to be more God-focused in times of adversity and it provides plenty of opportunity for self-reflection. It also gives practical suggestions on how to cope with the stresses and strains of postmodern life."